Ind-Ra also expects it to establish yardsticks to determine quality or grades of coal supplies, ensure adherence to supply contracts, adjudicate on disputes between suppliers and consumers and oversee the progress of mining rights/licenses granted to private companies. Allocation of fresh coal mines will, however, continue to be the prerogative of the GoI. MUMBAI : Government of India’s (GoI) recent decision to constitute an independent regulatory authority for the coal sector is a vital step for its much-needed overhaul. It can potentially bring considerable relief to industries which depend on coal as a critical input, most notably the beleaguered power sector, said India Ratings & Research (Ind-Ra) in its recent release. Notwithstanding the reportedly large coal reserves in India, the sector is characterised by acute shortages, poor quality, inefficient mining practices and distorted pricing mechanisms. These factors have had a crippling effect on power generation, a vital component of scaling up the country’s undernourished infrastructure sector. Many of these issues have been ascribed to the virtual monopoly enjoyed by the state-owned Coal India Limited. It is yet unclear if price setting would also be included within the ambit of the proposed regulator. However, the proposed regulator is likely to determine the principles on the basis of which producers can price coal. Although GoI’s recent announcement has brought in considerable optimism, Ind-Ra believes the mere constitution of a regulator in itself cannot act as a panacea for all the problems facing the sector. The mandate given to the regulator and the resources provided to it for effective discharge of its duties in an independent and transparent manner, free from political interference, would be vital to realise GoI’s objectives. Concurrently, other reform measures such as restructuring Coal India and significantly expanding private sector’s participation in coal mining would also need immediate attention. The regulator is proposed to be set up through an executive fiat, demonstrating GoI’s urgency to address the problems plaguing the coal and power sectors. This is another milestone in the GoI’s reforms agenda that it has been pursuing fairly systematically in the last 12 months or so to fix many of the ills plaguing the stressed infrastructure sector. Parliament would need to pass a legislation constituting the authority and thereby ratifying the Government action – a bill to this effect is likely to be introduced in the ensuing session. Earlier this year, a Group of Ministers had approved this proposal and recommended a revised draft bill for consideration of the Cabinet. NYMEX crude for August delivery was down 16 cents at USD 102.98 a barrel by 0018 GMT, after settling down 8 cents at USD 103.14 on Monday. It touched a 14-month high of USD 104.12 on Monday. Click on Image to get 100% sure crude oil tips now! US crude futures retreated to just below USD 103 a barrel on Tuesday, pressured by the return of a Libyan oilfield and Iraqi pipeline that eased concerns about global oil supplies. London Brent crude for August delivery was down 34 cents at USD 107.09 a barrel, after settling down 29 cents. Libya’s major Sharara oilfield will resume operations after an agreement was reached with the armed group that shut it down last month, a senior Libyan oil source said on Monday. A pipeline from Iraq to the Turkish port of Ceyhan will also resume operations in two to three days following an interruption caused by a leak, two sources in Iraq’s state-run North Oil Company (NOC) said on Monday. Clashes in Egypt that left at least 51 people dead heightened geopolitical risk, but there has been no impact to ports and shipping through the Suez Canal. Egypt will hold new parliamentary elections once amendments to its suspended constitution are approved in a referendum, the interim head of state decreed on Monday, setting out a time frame that could see a legislative vote in about six months. US commercial crude oil stocks likely fell by 3.3 million barrels last week, a Reuters poll showed on Monday. Distillate stocks likely rose by 1.3 million barrels, while gasoline stocks were seen up 1.2 million barrels. The Standard & Poor’s 500 Index rose 0.53 percent on Monday, edging closer to its all-time high set in May. The dollar paused in its rally as investors bought beaten-down currencies such as the Australian dollar on Tuesday, although its broad uptrend is seen intact as the market tries to position for when the US Federal Reserve will start to slow its stimulus. Gold fell to a three-year low on Friday and was in danger of recording its biggest weekly drop in 30 years after the US Federal Reserve said it would wind down its bullion-friendly stimulus later this year. Spot gold – down nearly 9 percent this week – dropped for the fifth straight session, while Comex gold futures also declined over 1 percent to their lowest in three years. Fed Chairman Ben Bernanke said on Wednesday the central bank would taper its USD 85 billion monthly bond buying programme as the US economy was recovering strongly, ending purchases around mid-2014 if economic growth held up. “What the market is undergoing now is a state of normalisation, going back to pre-stimulus times,” said Joyce Liu, investment analyst at Phillip Futures in Singapore. Gold was also hurt by CME Group Inc’s move to raise initial margins for Comex gold after prices plunged over 6 percent on Thursday. The exchange operator raised Comex 100 Gold Futures initial margins for speculators by 25 percent to USD 8,800 per contract from USD 7,040. “That is definitely affecting gold too. For those who cannot put out margin calls on time, they will be squeezed out even when they don’t want to get out,” said Liu. 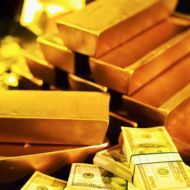 Until recently, gold – seen as a hedge against inflation – had gained as the global economy took a hit and central banks acted to boost their economies. Gold touched an all-time high of USD 1,920.30 in 2011. Spot gold was down 0.5 percent at USD 1,271.16 an ounce by 0121 GMT on Friday. The metal fell to USD 1,269.04 earlier – its lowest since September 2010 and a level which would mark the worst weekly decline in 30 years. It has lost 24 percent of its value this year, after recording 12 years of gains. 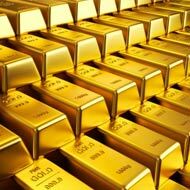 Gold is on weak technical ground and will fall below USD 1,200 an ounce before finding support, technical analysts said. UBS lowered its 2013 gold price outlook by 10 percent to USD 1,440 an ounce, and its 2014 forecast to USD 1,325 an ounce from USD 1,625. SPDR Gold Trust, the world’s largest gold-backed exchange-traded fund, said its holdings fell 0.42 percent to 995.35 tonnes on Thursday – the lowest in more than four years. But the drop in prices could see a spurt in physical demand in top consumers India and China, which have been quiet recently. However, Liu said the demand would not be as strong as April when gold prices fell the most in 30 years over just two days.